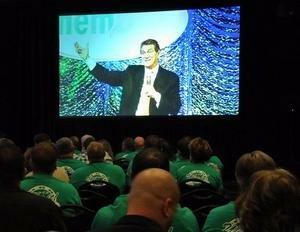 Joe Theismann Tells Chem-Dry Carpet Cleaning Franchise Owners: "It's Good to Be Around No. 1s"
LAS VEGAS, NV--(Marketwired - Feb 3, 2015) - Football legend Joe Theismann shared jokes and lessons about success with hundreds of Chem-Dry carpet cleaning franchise owners who gathered Jan. 26-29 for the company's convention in Las Vegas. "I have had the opportunity to be part of some very special things, and one of the lessons I learned along the way is that you never accomplish anything significant by yourself," Theismann said. "Being part of a team matters." Theismann, who delivered the morning keynote to kick off the convention, encourages franchisees to take advantage of the networking opportunities, learning sessions, and camaraderie that filled the event. "All of you, as franchisees and Chem-Dry's head office -- together you form a bond. You are part of a great company -- the best in the world. You are part of a world champion," he said. "And it's not about just your individual success -- it's about the success of the entire team. The sharing, the working together, that's what makes you special." Chem-Dry is the world's largest carpet cleaning franchise with more than 3,500 locations that serve 10,000 homes a day. It is Entrepreneur magazine's top-rated carpet cleaning franchise and one of its Top 10 choices for low-cost and home-based franchises. Its hot carbonating extraction process delivers a deeper, healthier, faster-drying clean that appeals to homeowners and business owners -- and the process can be used to clean tile and stone, upholstery and other surfaces, too. Chem-Dry's annual convention is designed to help franchisees have fun and learn -- allowing them to take home new ideas for growing their businesses and boosting their profits. "I love it," Justine Jensen said of attending Chem-Dry conventions. She owns Integrity Chem-Dry in Riverside, California, with her boyfriend Tim Goeler. "I think it's a lot of knowledge and it just helps you grow even further in the Chem-Dry system. It makes a big difference in your ROI." Jensen and Goeler says that they have seen revenue growth every year since they started their business a decade ago. They recently expanded from three franchises to seven. The keys to their success have been hard work and an eagerness to learn from others on the Chem-Dry team. The average tenure for Chem-Dry owners is 17 years. Be part of a team. Theismann says that his success was dependent on everyone around them doing their job and helping him. Being part of Chem-Dry makes franchisees part of a team, and they should remember that they have a great group of people working to help them do their best. Embrace the team attitude. Innovate. Jensen and Goeler say that the advice they have received from Chem-Dry and from fellow franchisees has helped them pivot their business. "What we were doing five years ago is now obsolete," Goeler says. Theismann said that great teams win by innovating, which has always been one of Chem-Dry's strong suits. Play to Win. Be passionate, and believe in what you are doing, or don't do it, Theismann said. The first step in achieving your goals is actually setting them! Then you can take the steps you need to take to achieve them. Theismann noted that Chem-Dry franchisees have been successful for more than 37 years, then worked the room asking people if they believe they had what it takes to be successful. The answer? Thunderous applause. To learn more about Chem-Dry, and to decide if you are ready to join the team, visit www.chemdryfranchise.com.